The Barlow has an excellent extra-curricular programme that offers our students many opportunities to participate in additional activities. Our organised activities not only widen learning experiences but make school life more enjoyable. The school runs a number of clubs both at lunchtime and after school, allowing pupils to enhance the skills they have learned during their lessons and gain new skills in areas in which they are interested. Pupils can join clubs that focus on Art, Design and Technology, Science, Drama, ICT, English and Sport. The Music Faculty offers instrumental tuition. Lessons are available for those wanting to learn to play the piano, drums or a brass, woodwind or string instrument. Pupils who receive free lessons are required to take part in one lunchtime or after school ensemble. These ensembles include the School Choir, Vocal Harmony Group, Brass Group, String Group, Rock School, Samba Band, MC/Rap Group and Keyboard Club. We also organise school concerts, Masses and Liturgies, fundraisers and music competitions. Our talented musicians perform at the Christmas concert. The Barlow aims to put together theatrical productions each academic year. The whole school gets involved, with many of our students not only performing on stage, but supporting backstage too. Previous productions have included Bugsy Malone and Grease. The PE Faculty operates a wide range of clubs, from traditional team games such as football and netball to non-competitive activities such as trampolining. The school holds competitive fixtures against other schools and we enter our pupils into as many competitions as possible. We encourage all our pupils to take part in extra-curricular sports regardless of their ability. Pupils get a ‘sports credit’ for every club they attend and those with the most ‘credits’ at the end of term go on a reward trip. The Barlow runs a series of study support lessons for a range of subjects throughout each year, with targeted intervention strategies at key points in Years 10 and 11. This programme includes lunchtime drop-ins, coursework catch ups-and revision sessions and provides additional support and rewards for our pupils. Our pupils have regular opportunities to visit museums, exhibitions and theatres, as well as longer residential trips within the UK and abroad. The English Faculty take pupils to London and the destination of choice for the Maths trip is Paris. Homework is work that is set to be done outside the timetabled curriculum and is independent study. It is important in raising student achievement, enhancing learning and is an integral part of the curriculum. Student may opt to complete homework in school during our Homework Club in the Library after school; here they have access to books, computers, software, equipment and other resources that are more readily available at school to support them completing their homework. Exams Equipment – Make sure you are properly equipped for every exam. You should bring two black ball-pens, a pencil, eraser, sharpener and any other writing equipment needed to your exams. Check with your teacher if you think you will need any specialist equipment. If you can’t find the revision materials you need here please contact your subject teacher. The Barlow’s Student Leadership and Prefect Team gives our pupils the chance to voice their thoughts about school. Student Leaders and Prefects are nominated by their classmates and represent each Family Group across all the Years. Each half-term they meet to debate and discuss issues which are important to students, as determined by the Leaders and Prefects. The Leadership Team make recommendations to the the Headteacher about school issues such as teaching and learning, student behaviour, rewards, extra-curricular activities and school policies. Leadership means a lot of different things to a lot of different people. You might want to start by researching different views on leadership with your fellow students or teacher. This award recognises all sorts of different leadership activities,that you may well already have done or be doing. You might be on the school council, write for the school newsletter, be captain of a sports team, be a form register monitor, it really doesn’t matter as long as you are displaying the skills listed on the criteria grid. How do you get the Award? We suggest that you collect this evidence together in a portfolio (a folder)–at least one piece of evidence for each strand. The evidence could be anything: screenshots, letters or emails, photos, stills from videos, certificates, PowerPoint slides, a teacher testimony etc . You will also need to get your teachers’ signatures once you have completed a strand. The Student Learning Forum currently comprises of eight Year 10 students who made successful applications as part of the school’s leadership programme. These are; Ellie Jackson, Grace Allistar, Isabella Jordan, Julia Concannon, Alisha Elliott, Ellen Furey, Chike Nwobodo and Annie Thomas. The aim of the Student Learning Forum is to strengthen the learning experience in our school for both students and teachers alike, hence the motto that students have developed: Strengthening Learning For Everyone. This aim is now being realised through the work of the Student Learning Forum members. They have spent time researching factors that affect performance in education and compiled their findings in a way that would send a clear message to their peers. They developed a poster, which is now displayed in all classrooms and communal areas around school, to develop understanding of how success in education can be achieved. Additionally, they have spent time researching effective starting points for lessons, as well as drawing on their own experiences. They have identified a number of effective ‘Starter’ activities and have compiled them in a leaflet, which is available for use by all staff. Strategies have also been shared with newly qualified staff during a bespoke CPD session. Democracy is one of our important British values and we really wish this to be embedded into our school ethos. Our school council members are all democratically elected by Family Groups and then Heads of Year select year group representatives. We have a number of council meetings and it is fantastic to see so many exciting ideas from young people who are so passionate for change. Our main areas of focus so far are pupil well-being, how to care for our school environments and school rewards. So watch this space for the changes we make!! At The Barlow, we invited The Diana Award into our school in December 2018, to train not only some of our selected students and staff to become Anti- bullying Ambassadors but also several local schools. The training was an all-day event, which provide a great opportunity for our school to meet other schools within our local community to share ideas and partake in shared activities. The day empower all of the young people and staff members by providing knowledge of what bullying is and how to tackle it. 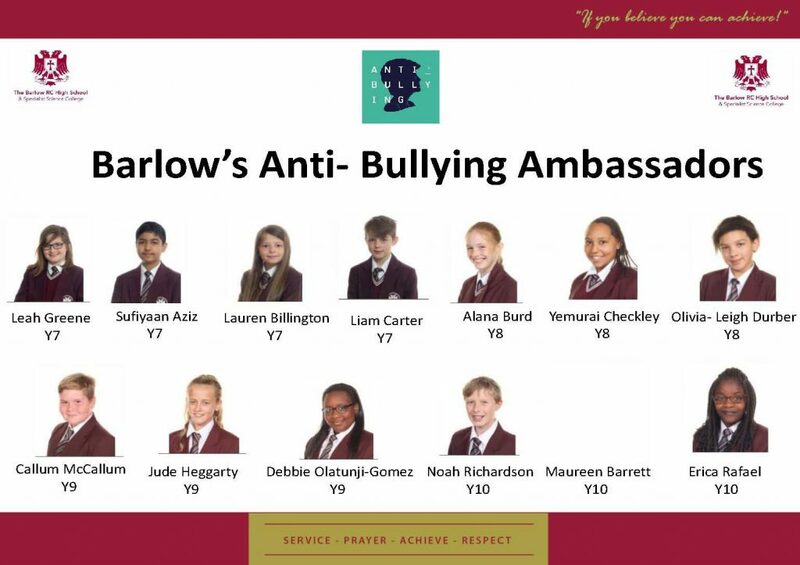 At the end of the day, students made an action plan of how to approach reducing bullying in our schools, became Anti-Bullying Ambassadors and The Barlow became a lead Anti- bullying school in our local area. The training empowered students and staff to change the attitudes, behaviours, and cultures of bullying by building skills and confidence to address different situations both on and offline. This is all delivered through The Diana Award’s renowned peer-led approach. As Anti- bullying Ambassadors, moving forward we be training the rest of our students and staff. We also have lots of exciting ideas to introduce each half term.